A sensor includes a signal generation module including a magnetic sensor to provide position information for generating first and second waveforms corresponding to the position information. An analog signal processing module provides an algebraic manipulation of a subset of the first waveform, the second waveform, a first inverted waveform, and a second inverted waveform, to generate a linear output signal. As is known in the art, there are a variety of rotational sensors for determining angular position. In one type of sensor, Hall effect modules are used to generate sine and cosine signals from which angular position can be determined. Such sensors use digital processing to process the sine and cosine signals generated from the Hall cells. Due to analog to digital signal conversion and other factors, such digital processing imposes limitations on the speed and accuracy of angular position determination. For example, part number AS5043 from Austria Microsystems is an angular position sensor that digitally processes information from a Hall array using a coordinate rotational digital computer (CORDIC) that implements an iterative calculation for complex math with a lookup table. Other sensors use similar digital processing to implement various processing algorithms for computing position information. The present invention provides a rotational sensor that generates a linear output from phase-shifted waveforms generated by magnetic sensors using analog signal processing. In one embodiment, the sensor is provided on a single substrate. With this arrangement, an efficient and cost effective sensor is provided. While the invention is shown and described in exemplary embodiments as having particular circuit and signal processing implementations, it is understood that the invention is applicable to a variety of analog processing techniques, implementations, and algorithms that are within the scope of the invention. In one aspect of the invention, a sensor includes a signal generation module including a magnetic sensor to provide position information for generating first and second waveforms corresponding to the position information. An optional signal inversion module can be coupled to the signal generation module for inverting the first waveform to provide a first inverted waveform and for inverting the second waveform to provide a second inverted waveform. An analog signal processing module can be coupled to the optional signal inversion module for providing an algebraic manipulation of a subset of the first waveform, the second waveform, the first inverted waveform, and the second inverted waveform, from the signal inversion module and generating a linear position output voltage signal. where θ indicates an angle of a rotating magnet in the magnetic sensor, offset is a vertical offset of the first and second waveforms with respect to ground, A is an amplitude of the first and second waveforms, and k is a real number affecting gain and vertical offset of the output. The signal processing module can include an analog multiplier. The sensor can be provided on a single substrate. The sensor can include a magnet having a plurality of pole-pairs to increase waveform frequency for reducing maximum angular error. In another aspect of the invention, a sensor includes a magnetic position sensing element to generate angular position information, a first signal generator to generate a first waveform corresponding to the angular position information, a second signal generator to generate a second waveform corresponding to the angular position information, wherein the first and second waveforms are offset by a predetermined amount. The sensor can further include a first inverter to invert the first waveform for providing a first inverted waveform and a second inverter to invert the second waveform for providing a second inverted waveform, wherein the first and second waveforms are inverted about an offset voltage, and an analog signal processing module to generate a linear output signal from the first waveform, the second waveform, the first inverted waveform, and the second inverted waveform. The sensor can include one or more of various features. The first and second waveforms can be used by the signal processing module in a first region and the first inverted waveform and the second inverted waveform being used in second region to generate the linear output signal. The first region can correspond to about 180 degrees of angular position for the position sensing element. A region indicator can indicate a first or second region of operation. In a further aspect of the invention, a sensor includes a signal generator means including a position sensor, a signal inversion means coupled to the signal generator means, and an analog signal processing means coupled to the signal inversion means to generate an output signal corresponding to angular position of the position sensor. In one embodiment, the sensor is provided on a single substrate. In another aspect of the invention, a method includes providing a signal generator module including a magnetic position sensing element, coupling a signal inversion module to the signal generator module, and coupling an analog signal processing module to the signal inversion module to generate a linear output signal corresponding to information from the position sensing element. The method can include one or more of providing the signal generator module, the signal inversion module, and the signal processing module on a single substrate, and generating first and second waveforms corresponding to the information from the position sensing element and inverting the first and second waveforms to generate the linear output signal. FIG. 38 is a graphical depiction of signals in the circuit of FIG. 37. FIG. 1 shows an analog position sensor 100 having a signal generation module 102 to generate waveforms from magnetic sensors that are provided to an optional signal inversion module 104, which generates inverted versions of the waveforms. A signal processing module 106 implements an analog algebraic manipulation of the waveforms. The signal manipulation module 106 generates a linear output voltage that is proportional to angular position. In one embodiment, the sensor is provided on a single silicon substrate. FIG. 1A shows a magnetic sensor shown as an exemplary Hall effect device 150 having a permanent magnet 152 with a first magnetic sensor 154 to generate a sine wave and a second magnetic sensor 156 placed ninety degrees from the first sensor to generate a cosine wave. The angular position θ of the rotating magnet 152 can be determined from the sine and cosine signals to provide a linear sensor output. In an exemplary embodiment, the sensor circuit has a 360° sensing range and operates on a single power supply. where output is the sensor output, A is the amplitude of the generated sine and cosine signals, offset is the vertical offset of the sinusoidal signals with respect to ground, and k is any real number, where k affects the gain and vertical offset of the final sensor output. In general, the value for k should be set so that the mathematical value of the output falls within the desired operational range. In a second region of 135° - 315°, the input sinusoids are inverted around the offset voltage as compared to the first region. The illustrated model assumes that A = 2 volts, offset = 2.5 volts, and k = 2. Using these observations, the model for Equation 1 can be modified so that the output signal has the same degree of linearity in both regions and is periodic over the two regions. In one particular embodiment, this modification is performed by inverting the waveforms if they fall within the range of 135° - 315° (the second region), as shown in FIG. 3. As shown, the sine waveform 200', cosine waveform 202', and average signal 204', are inverted in the range of 135° to 315°, which corresponds to - sin(θ) > cos(θ) where -sin(θ) refers to the inversion of the sine wave about an offset voltage, sin(θ) and cos(θ) embody the amplitudes and offsets associated with the sinusoids as described by Equation 1. Exemplary parameters are A = 2 volts, offset = 2.5 volts, and k = 2. Alternatively, the region indicator 250 can be used to vertically shift up the sensor output of the 180° - 360° or second region to create a linear ramp. The magnitude of the vertical shift is dependent on the variable k.
FIG. 5 shows an exemplary circuit implementation for an analog position sensor 200 in accordance with the present invention. The sensor 200 includes exemplary implementations for the signal generation, signal inversion, and signal processing modules 102, 104, 106 of FIG. 1, which are described in detail below. FIG. 6 shows one circuit implementation of a signal generation module 102 including first and second Hall effect devices 302, 304, each of which includes a Hall plate 306 and an amplifier 308 having offset trim and gain trim inputs. Alternatively, gain and offset trim values can be adjusted, such as by automatic gain control and/or automatic offset adjust. The first Hall effect device 302 outputs a sin(θ) signal and the second Hall effect device 304 outputs a cos(θ) signal, where θ represents a position of the rotating magnet. While the illustrated embodiment provides for the generation of sinusoidal signals using linear Hall effect devices, a variety of other magnetic sensors can be used, such as a magnetoresistor (MR), a magnetotransistor, a giant magnetoresistance (GMR) sensor, or an anisotrpic magnetoresistance (AMR) sensor. In addition, while sinusoidal waveforms are shown, it is understood that other suitable waveforms can be used to meet the needs of a particular application. A first signal inverter 310 inverts the sin(θ) signal to provide a -sin(θ) signal (where -sin(θ) is inverted about an offset) and second signal inverter 312 inverts the cos(θ) signal to provide a -cos(θ) signal (where -cos(θ) is inverted about an offset). With the inverters 310, 312, each of sin(θ), -sin(θ), cos(θ), and -cos(θ) signals are available to the signal inversion module 104 (FIG. 7). A comparator 314 receives as inputs cos(θ) and -sin(θ) to generate a region indicator bit (inverted or non-inverted sin and cos signals as noted above). The comparator 314 implements the - sin(θ) > cos(θ) determination described above to generate the region indicator bit. The signal generation module 102 also includes a regulated voltage supply 316, e.g., 5V, and a bias reference voltage 318, e.g., 2.5V. While a supply voltage of 5V is used in an exemplary embodiment, the particular voltage used can be varied while still meeting the relationships set forth in Equations (2) and (3) hold. FIG. 7 shows an exemplary signal inversion module 104 circuit implementation to invert the sinusoidal signals generated from the magnetic sensors 302, 304 (FIG. 6) in the 135° - 315° (second) region. In the illustrative implementation, the original (sin(θ) and cos(θ)) signals and the inverted signals (-sin(θ) and -cos(θ)) are provided as inputs to a 2-input analog multiplexer 350. The comparator 314 output, which can correspond to the region indicator bit 250 of FIG. 4, controls the output of the multiplexer 350. That is, the region indicator bit 250 determines whether inverted or non-inverted signals are output from the analog multiplexer 250. The multiplexer 250 outputs can be buffered with respective amplifiers 352, 354 for input to the signal processing module 106 (FIG. 8). The point between the resistors R1, R2 provides (sin(θ) + cos(θ))/2. This signal is buffered and input to the analog multiplier 400. The sin(θ) signal is provided as a second input (numerator in Eq. 1) to the analog multiplier 400, which provides implicit division using the analog multiplier 400. It is understood that the circuit includes the waveform inversion for multi-region linearity in accordance with Equation 4. In one particular embodiment, the analog multiplier 400 operates on a single supply and assumes that ground is equal to mathematical zero. It is understood that other circuit embodiments can operate with a variety of voltages, e.g., 0.5V, as "ground" to avoid effects associated ground variance, for example. Note that this division operation only requires two-quadrant division (or multiplication), since both incoming signals are assumed to be mathematically positive. The output from the analog multiplier 400 is processed to provided gain and offset correction for output in a range of 0.5V to 4.5V, in the illustrated embodiment. While the invention is primarily shown and described as implementing a particular algebraic relationship to achieve an analog position sensor on a single substrate, it is understood that other algebraic relationships can be implemented. where output is the sensor output, A is the amplitude of the generated sine and cosine signals, offset is the vertical offset of the sinusoidal signals with respect to ground, and k is any real number, where k affects the gain and vertical offset of the final sensor output. This changes the inversion point (i.e. application of the "-" term) to: 0 > cos(θ). Also, the phase of the output is now aligned identically with arctangent rather than being out of phase with arctangent by 45°. FIG. 9 shows an exemplary sensor package 500 having an illustrative pinout of Vcc and Gnd with sin(θ) and cos(θ) pins, a region indicator, and position output signal. It will be appreciated that a variety of pinout configurations are possible. In one embodiment, the sensor package includes a sensor on a single substrate 502. For exemplary sensor implementations, it may be desirable to provide an output of the angle sensor that is ratiometric with the supply voltage so that it can interface with the LSB (least significant bit) of various circuits, such as ADCs (analog to digital converters). In order for the output of the division stage, such as the one described above, to be ratiometric with the supply voltage, the following relationships can be applied: k=0.4*Supply, A = 0.4*Supply, and the offset = 0.5*Supply. As long as these relationships hold, the sensor output will scale ratiometrically. Alternatively, assuming that Supply = 5V, then if you only allowed A and offset to be ratiometric, the output of the divider stage will be exactly the same regardless of how low the supply drops (assuming it does not clip the output). Ratiometry can be achieved by scaling the output of the division stage by Supply/5. It is understood that ratiometry can be achieved using other mechanisms. Implementing an analog sensor on a single substrate in accordance with exemplary embodiments of the invention provides smaller packages with fewer components as compared with convention sensors having digital signal processing cores. In one particular embodiment, a sensor includes AMR and circuitry on a single die. In other embodiments, angle sensors can have multiple dies, such as for GMR, AMR, GaAs, and various silicon Hall sensors. In one particular embodiment shown in FIG. 9A, an angle sensor includes multiple dies with a first die D1 in a CMOS process for the circuits and a second die D2 providing a different Hall plate doping for the sensor. Other embodiments include one die with signal processing and two GaAs die and/or two MR die. It should be noted that the GMR die act in a different plane of sensitivity so that the sensors need to be positioned appropriately, for example closer to the center of the axis of rotation. In addition, manufacturing costs will be reduced and steady state conditions will be reached sooner than in conventional devices. In another aspect of the invention, an angle sensor increases sinusoidal frequency to provide higher output resolution. It is known that rotating a diametrically bipolar disc magnet above two 90° mechanically offset magnetic sensors will generate a sin/cosine signal pair as the output of the magnetic sensors. One 360° revolution of the magnet will correspond with one period of the sine and cosine signals. By increasing the frequency of the sinusoids over one 360° revolution, higher output resolution is achieved in angle sensing. As described above, a pair of sine/cosine signals for angle sensing applications can be generated by placing two magnetic sensors at a 90° mechanical offset around the center of a rotating diametrically bipolar disc magnet. Placing two Hall plates at a 90° mechanical offset around the center of a diametrically bipolar disc magnet produces a sine/cosine signal pair. where θEXPECTED (θ) is the expected angular output at a given angle θ, VOUT(θ) is the expected output voltage of the magnetic sensor at a given angle 9, VOFFSET is the offset of the output voltage, VFULL_SCALE is the full scale voltage range of the output voltage, and θRANGE is the angular range of the output voltage ramp. The sine and cosine signals 600, 602 are shown as well as the output voltage VOUT(θ) 604. Observe in Equation 21 that the error is a function of the angular range of the output θRANGE. The maximum angular error (VERROR_MAX) can be reduced if θRANGE is decreased while the other variables remain fixed. It is possible to decrease θRANGE by increasing the frequency of the sinusoids over one 360° rotation of the magnet. If a ring magnet, for example, is used in place of a diametrically bipolar disc magnet then more sinusoids can be generated in a single rotation. For example, if a three-pole pair magnet is used, then the frequency of the sinusoids increases by a factor of three, as shown in FIG. 11, and therefore, θRANGE decreases by a factor of three as shown in FIG. 12. If θRANGE decreases by a given factor, then VERROR_MAX will decrease by the same factor. FIG. 11A shows an alternative embodiment showing a multi-pole 'donut' magnet. Magnetization is radially outward from the center. In the configuration of FIG. 11, first and second sensors 650, 652 are offset by ninety degrees on a ring magnet 654 having an odd number, i.e., three, of poles. FIG. 12 graphically shows signals for the configuration of FIG. 11. The sine, cosine and output VOUT signals 656, 658, 660, as well as θRANGE 662 and VOFFSET 664. It is understood that increasing the frequency of the sinusoids with a ring magnet can be applied to any number of pole-pair combinations. Note that a given ring magnet can have several different possible sensor placements that generate the same sine(θ) and cos(θ) signals. While exemplary embodiments are shown and described as having a ring magnet, it is understood that other suitable devices can be used to generate waveforms. FIGs. 13 and 14 show exemplary magnetic sensor placements for a ring magnet with two pole-pairs. FIG. 13 shows a ring magnet 700 having first and second pole pairs. A first sensor 702 is placed at an intersection of north/south, and the second sensor 704 is placed in the adjacent south pole for a separation of about forty-five degrees. FIG. 14 shows a ring magnet 750 having a first sensor 752 at an intersection of north/south poles and a second sensor in the non-adjacent south pole for a separation of about 135 degrees. As can be seen the resultant sine and cosines signals are the same for both configurations. As described above, a region indicator bit can be used to distinguish two adjacent output ramps over a single period of the sinusoidal input. In multi-pole embodiments, a region indicator bit can be used to distinguish the multiple output ramps over a 360 degree rotation of a ring magnet. Using the region indicator bit as input to a counter, one can determine the angular region of operation of the magnet. The counter can reset back to zero after cycling through all of the regions. This approach will work as long as the device starts in a known angular region (e.g. 0 - 90°, for the case of four regions of magnetization for the "magnet") and the magnet is rotated in one direction. If the magnet rotates in both directions it is possible to use an up/down counter in conjunction with a direction detection algorithm to determine the region of operation. However, the device must start in a known angular region. As shown in FIG. 15, a region indicator bit distinguishes first and second ramps 802, 804 generated over one period of the sinusoidal signal. If the region indicator bit is sent as input into a counter, then the counter can be used to distinguish the four 90° regions of operation over a 360° rotation of the magnet. While exemplary embodiments discuss the use of a Hall effect sensor, it would be apparent to one of ordinary skill in the art that other types of magnetic field sensors may also be used in place of or in combination with a Hall element. For example the device could use an anisotropic magnetoresistance (AMR) sensor and/or a Giant Magnetoresistance (GMR) sensor. In the case of GMR sensors, the GMR element is intended to cover the range of sensors comprised of multiple material stacks, for example: linear spin valves, a tunneling magnetoresistance (TMR), or a colossal magnetoresistance (CMR) sensor. In other embodiments, the sensor includes a back bias magnet to sense the rotation of a soft magnetic element, and/or target. In another aspect of the invention, signal processing circuitry required to increase the frequency of sinusoidal signals that are created by rotating a single pole magnet over Hall elements processes the output voltage from the magnetic sensors and generates signals of greater frequency that can be used to obtain a better resolution when applied to an angle sensing algorithm, such as that described above in Equation 1. As described above, a linear output from the sine and cosine inputs can be generated by rotating a single bipolar magnet over two individual Hall elements. With a linearized signal, a change in y-volts in the output directly corresponds to x degrees of rotation. In accordance with exemplary embodiments of the invention, increasing the frequency of the input sinusoids in turn increases the output resolution by increasing the number of linear output ramps over a period of 360°. If the doubled frequency signals produced by Equations 26 and 27 are sent as inputs into the angle sensing mechanism of Equation 1, the output will have four linear ramps over a revolution of 360°. This doubling of linear ramps will result in a doubling of the overall resolution of the angle sensing. where offset is the vertical offset of the sinusoidal signals with respect to mathematical zero (e.g. ground). Note that the complexity in determining decoder bit one is a result of the -45° phase shift in the output of the previous angle sensing relationship. It is possible to change the -45° phase shift, thus simplifying the comparison process, by using a different form of the algorithm than described in Equation 1. To generate the signal for decoder bit two in Table 1 above, the following relationship can be utilized. FIG. 16 shows a timing diagram with respect to the output 1000 for decoder bit one 1001 and FIG. 17 shows a timing diagram for decoder bit two 1002. FIG. 18 shows an exemplary schematic implementation 1010 of the angle sensing mechanism described above. The circuit 1010 includes a sine input 1012 and a cosine input 1014. A region circuit 1016 generates the decoder bit one. A algebraic circuit 1018 implements equations 26 and 27 to provide sin(2θ) and cos(2θ) to an angle sensing circuit 1020, such as the circuit shown in FIG. 5. The algebraic circuit 1018 generates component signals sin(θ) and cos(θ), which are multiplied by two and cos2(θ) from which sin2(θ) is subtracted.. The number of linear ramps in the output is proportional to the frequency of the input; for the example using Equations 28 and 29 there would be three linear output ramps. Decoding circuitry can distinguish the region of operation for each of the linear ramps. In a further aspect of the invention, an angle sensing output has a nonlinear waveform that can be complemented with a second signal so that an average of the two signals has an enhanced degree of linearity. where output is the sensor output, A is the amplitude of the generated sine and cosine signals, and offset is the vertical offset of cosine with respect to ground. The minus sign is applied if cos(θ) <0. Recall that the output of Equations 1 and 30 is not truly linear, but has a theoretical best-case maximum error of ± 0.33 degrees assuming that one period of the input sinusoids corresponds with one 360 degree revolution of a magnet. One can choose a value for the value of the offset in Equation 30 that generates a nonlinear waveform. It is possible to then generate a second waveform with complimentary nonlinearity to the first. In one embodiment, this is performed by using a slightly modified version of Equation 30 as shown in Equation 31 below. The average of the first and second waveforms can have a higher degree of linearity than the best-case error of Equation 30 alone. where k is a scaling factor. 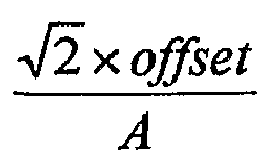 Note that A and offset have the same value for both equations. Choosing the values of k= 0.309 and offset = 1.02A produce the waveforms shown in FIG. 20. The output 1100 of Equation 30 and the output 1102 of Equation 31 show that their respective nonlinearities compliment each other so that the average of the two waveforms has a higher degree of linearity. The resulting output has a best-case maximum error of 0.029 degrees for the values of offset and k chosen above. Averaging the waveforms 1100, 1102 results in an output with a best-case maximum error of 0.029°. This is an order of magnitude less than without the inventive complementary waveform averaging. where A is the amplitude of sine and cosine, offset is the offset of cosine, and k is a scaling factor. Inversion is applied (i.e., minus sign) when cos(θ) <0. FIG. 21 below shows an exemplary implementation of Equation 32 in circuitry. For example if offset1 = 1.36 and offset2 = 4.76, then the output of Equation 33 would have an error of about ± 0.15°. Manufacturing placement tolerances that affect the relative placement of two Hall or MR sensors that do not reside on a single substrate. This would be advantageous in the case where a silicon signal processing die is interfaced with two or more GaAs Hall plates or MR (magnetoresistive sensors). The conventional approach for generating a pair of sine/cosine signals required for angle sensing applications is to place two Hall plates at a 90° mechanical offset around the center of a rotating magnet. A disadvantage of this approach is that any misalignment in the 90° mechanical offset of the Hall plates results in a phase error between the sin and cosine signals. The primary source of mechanical misalignment comes from the end user's inability to precisely align the magnet above the device package. For example, a magnet placement misalignment of five mils can result in a phase error of up to about ± 8.33°. Such a phase error translates to an angular error of approximately ± 8° for arctangent algorithms. Phase error is one of the leading sources of error in angle sensing algorithms. In accordance with exemplary embodiments of the invention, the phase difference between a Hall/MR generated sine/cosine signal pair is trimmed, as described in detail below. Note that this trimming may be difficult to implement when cos(θ) is constructed using ninety degree offset sensors. where A, B and C are the gains of their respective sinusoids, and α, β, γ are their phases. An exemplary technique for constructing cos(θ) is described in the below. As shown in FIG. 22, initially first and second Hall signals S1 and S2 are generated by respective Hall elements 1200, 1202. Let S1 = Asin(θ), where A is some arbitrary gain. Note that it is assumed that Asin(θ) is a reference signal and therefore it has no phase error associated with it. Let S2 = Asin(θ+β) where 90° < β < 180°. For example, if A = 1 and β = 125°, then S1 = sin(θ) and S2=sin(θ+125°). Generate S2 by placing the second Hall at a mechanical phase offset with respect to S1. where G is a gain factor and C is the amplitude of the resulting cosine signal. The second signal S2 can be gained by G. Where β = 125°, one can calculate (Equation 38) that G = 1.74. As a result, S2 = 1.74sin(θ+125°), as shown in FIG. 23. Now let S3 = S1 + S2. As Equation 37 dictates, S3 = Ccos(θ), where C can be calculated using Equation 39. In the example, C = 1.43, so S3 = 1.43cos(θ), as shown in FIG. 24 where Asin(θ) and Gasin(θ+β) are added to get Ccos(θ). The third signal S3 is then attenuated so that its amplitude matches that of the first signal S1. This produce S1 = sin(θ) and S3 =cos(θ), as shown in FIG. 25. Ideally γ is equal to 90° since Csin(θ+90°)=Ccos(θ). It is known that S2 might have a phase error due to magnet misalignment, and its phase error will directly affect the phase of S3. However, it is possible to trim out error in the phase of S3 by adjusting the gain of S2, as shown in the example below. The phase of S3 can be 'fixed' by changing the gain of S2. Instead of having G = 1.74, let G = 2.37. This will make S2 = 2.37sin(θ+115°) and S3 = 2.14sin(θ + 90°). FIG. 26 shows how the gain factor G affects the output phase γ, for a few choices of β, which is the mechanical offset of S2 with respect to S1. The steeper the output curve is around 90°, the easier it is to fine tune γ via changing the gain factor G. In other words, for steeper curves around 90°, gain error has less impact on the final output angle. This is calculated in Table I, below, which summarizes the effect of the input phase β on the ability to construct a 90° phase shifted signal. Table I: As the input phase β decreases, the angle resolution increases. The angle resolution is calculated assuming that the gain factor G can be achieved to within ±1%. In a practical application, perhaps the best choice for β is 115°. The worst-case accuracy of the phase of cosine would be +0.44° assuming that β < ±10°. The next step is to regulate the gain of C so that it matches A. This mathematical process of constructing cosine is implemented in exemplary circuitry in FIG. 27. A cosine signal is generated from two input Hall signals Asin(θ) and AGsin(θ+β). To adjust for phase misalignment in β, the gain stage should be regulated. This example assumes that A = 0.5 V, G = 2.366 and β = 115°. In another aspect of the invention, a single waveform, which can be sinusoidal, is used to generate a corresponding cosine signal. As is known in the art, one obstacle in developing an angle sensing circuit is linearizing the sinusoidal inputs without relying on the memory of a previous state. As described above, a linear output can be provided from two sinusoidal inputs, e.g., sine and cosine signals are generated from rotating a single pole magnet over two spatially phase shifted Hall elements. In exemplary embodiments of the invention, trigonometric identities are applied to a single sinusoidal input in order to construct its corresponding cosine signal. In one embodiment, a triangle wave is generated that corresponds to the input sinusoid. The generation of this triangle wave does not require any memory of a previous state. which provides rectified cos(θ). A true cos(θ) signal cannot be calculated directly because the squaring terms in this identity make all values positive. To calculate true cos(θ) requires an indicator bit that will invert the rectified signal at the appropriate points. As shown above, a linear output can be calculated using a rectified sinusoidal signal. A sinusoidal input can be linearized by constructing its corresponding cosine signal. Initially, a sinusoidal input Asin(θ) is provided, as shown in FIG. 29. The sinusoid is manipulated, as shown in FIG. 30, to have the form A2sin2(θ). Then |Acos(θ)| can be calculated as shown in FIG. 31. The next step gains Asin(θ) and |Acos(θ)|by a constant, G to adhere to rules in Equations 44 and 45.
by virtue of the addition operation. As shown in FIG. 34, the "cane" waveform can be divided by the rectified G|Acos(q)| the output of which can be trimmed in output gain and offset accordingly. The output waveform corresponds with the peaks and troughs of the originating sinusoid. where G is the gain factor described above and offset is the vertical offset of the sinusoidal signals with respect to mathematical zero (e.g. ground). In an ideal case where there are no error sources, the minimum nonlinearity is 0.328°. This procedure for linearizing a sinusoid can be implemented in circuitry, such as the exemplary circuit shown in FIG. 35. The output of the circuit is shown in the simulated results of FIG. 36 for the input sinusoid 1300 and the triangular output 1302. For this example the input sinusoid has a frequency of 1kHz. To utilize this algorithm in a 360 degree angle sensing application a method of identifying the negatively sloped portion of the output is required. However, this would not be required for a 180 degree sensor. This identification can be in the form of an indicator bit that will invert the negatively sloped portion and distinguish the 0-180° region from the 180° - 360° region. This indicator bit may take the form of an additional magnetic field sensor that is used to identify the polarity of the magnetic field, i.e., north or south. Without this indicator bit the algorithm would only be capable of a range of 0-180°. Notice that the output differs from the mechanism of Equation 1 in that the phase of the output has a -90° phase shift rather than a -45° phase shift. The phase shift for an embodiment of Equation 1 considered 0° to be the point where the output was at a minimum. In another aspect of the invention, the gain and offset of the input sinusoids is controlled in order to reduce the final output error. Automatic Gain Control (AGC) and Automatic Offset Adjust (AOA) can be applied to the angle sensing embodiments described above. For example, one embodiment uses offset adjustment DACs (digital-to-analog) and gain cell transconductors that accept an input current from a current DAC to control the gain of an amplifier. U.S. Patent No. 7,026,808 , No. 6,919,720 , and No: 6,815,944 , which are incorporated herein by reference shows exemplary AGC circuits, and U.S Patent Application No. 11/405,265, filed on April 17, 2006 , which are incorporated herein by reference, disclose exemplary AOA embodiments. to solve for the actual gain, A. Scaling the sinusoids by some factor of A (where A is calculated using the equation above) will result in a final constant gain regardless of variations due to air gap displacement. This method of gain control is effective for signals with zero offset and matching gains, and it can be used in conjunction with other AGC methods. It is understood that gain and offset can be trimmed at end of line test and/or at customer final test, for example. It can also be adjusted at device power up or change dynamically during running mode. If dynamic adjustment of gain and offset is desired during operation the device can have a calibrate pin that enables or disables the adjust mode. This pin could also control the update speed in which the AGC and AOA corrections are applied to the output. The update frequency could be controlled by a timing mechanism or correspond with the falling edge transition of the algorithm's final output ramp. FIGs. 37 and 38 show an exemplary technique for controlling the speed of the AGC and AOA during running mode via a timing mechanism. An external capacitor C on a calibrate pin CAL charges the central node. When the voltage on the capacitor C reaches VREF, a comparator CO trips and discharges the capacitor. The comparator CO output will pulse high momentarily. AOA and AGC corrections can be updated whenever the comparator pulses high. Choosing different size capacitors can control the speed of the comparator pulses. Tying the CAL pin LOW will shut off the dynamic updating mode. In addition to the embodiments described previously and claimed in the appended claims, the following is a list of additional embodiments, which may serve as the basis for additional claims in this application or subsequent divisional applications. Embodiment 1: A sensor, comprising: a signal generation module including a magnetic sensor to provide position information for generating first and second waveforms corresponding to the position information; and an analog signal processing module for providing an algebraic manipulation of the first waveform and the second waveform to generate a linear position output voltage signal. Embodiment 2: The sensor according to embodiment 1, further including a signal inversion module coupled to the signal generation module for inverting the first waveform to provide a first inverted waveform and for inverting the second waveform to provide a second inverted waveform, wherein the signal inversion module outputs the first and second waveforms in a first region and outputs the first and second inverted waveforms in a second region. Embodiment 3: The sensor according to embodiment 2, wherein the second region corresponds to a position range in which output would be non-linear without inversion of the first and second waveforms. Embodiment 4: The sensor according to embodiment 3, further including a region indicator bit to indicate position range in the first or second region. Embodiment 5: The sensor according to embodiment 2, wherein the first region spans about one hundred and eighty degrees. Embodiment 6: The sensor according to embodiment 2, wherein the first region corresponds to - sin(θ) > cos(θ) where -sin(θ) refers to the inversion of the sine wave about an offset voltage, sin(θ) and cos(θ) embody the amplitudes and offsets associated with the sinusoids, and θ indicates an angle of a rotating magnet in the magnetic sensor. Embodiment 7: The sensor according to embodiment 6, wherein the first region corresponds to a range for θ of about 315 degrees to about 135 degrees. where θ indicates an angle of a rotating magnet in the magnetic sensor, offset is a vertical offset of the first and second waveforms with respect to ground, A is an amplitude of the first and second waveforms, and k is a real number affecting gain and vertical offset of the output. Embodiment 9: The sensor according to embodiment 1, wherein the signal processing module includes an analog multiplier. Embodiment 10: The sensor according to embodiment 1, wherein the sensor is provided on a single substrate. wherein A is an amplitude of the first and second waveforms, b is a constant and θ indicates an angle of a rotating magnet in the magnetic sensor. Embodiment 12: The sensor according to embodiment 1, wherein the magnetic sensor includes a magnet having a plurality of pole-pairs to increase a frequency of generated waveforms for reducing a maximum angular error. Embodiment 13: The sensor according to embodiment 12, wherein the magnet is a ring magnet. Embodiment 14 The sensor according to embodiment 1, wherein the magnetic sensor is a Hall effect sensor. Embodiment 15: The sensor according to embodiment 1, wherein the magnetic sensor is an AMR sensor. Embodiment 16: The sensor according to embodiment 1 wherein the magnetic sensor is a GMR sensor. Embodiment 17: The sensor according to embodiment 14, further including a first die for circuitry and a second die for a Hall effect sensor. Embodiment 18: The sensor according to embodiment 17, wherein the second die is formed from GaAs. Embodiment 19: The sensor according to embodiment 1, further including automatic gain control for the first waveform. Embodiment 20: The sensor according to embodiment 1, further including automatic offset adjust of the first waveform. Embodiment 21: A sensor, comprising: a magnetic position sensing element to generate angular position information; a first signal generator to generate a first waveform corresponding to the angular position information; a second signal generator to generate a second waveform corresponding to the angular position information, wherein the first and second waveforms are offset by a predetermined amount; a first inverter to invert the first waveform for providing a first inverted waveform and a second inverter to invert the second waveform for providing a second inverted waveform, wherein the first and second waveforms are inverted about an offset voltage; and an analog signal processing module to generate a linear output signal from the first waveform, the second waveform, the first inverted waveform, and the second inverted waveform. Embodiment 22: The sensor according to embodiment 21, wherein the first and second waveforms are used by the signal processing module in a first region and the first inverted waveform and the second inverted waveform are used in second region to generate the linear output signal. Embodiment 23: The sensor according to embodiment 22, wherein the first region corresponds to about 180 degrees of angular position for the position sensing element. Embodiment 24: The sensor according to embodiment 22, further including a region indicator for the first and second regions. Embodiment 25: The sensor according to embodiment 21, wherein the magnetic sensor includes a magnet having a plurality of pole-pairs to reduce a maximum angular error of the magnetic sensor. Embodiment 26: The sensor according to embodiment 21, further including providing the sensor on first and second dies. Embodiment 27: A sensor, comprising: a signal generator means including a position sensor; a signal inversion means coupled to the signal generator means; and an analog signal processing means coupled to the signal inversion means to generate an output signal corresponding to angular position of the position sensor. Embodiment 28: The sensor according to embodiment 27, wherein the signal generator means includes a magnet having a plurality of pole-pairs. Embodiment 29: The sensor according to embodiment 27, wherein the sensor is provided on a single substrate. Embodiment 30: The sensor according to embodiment 27, wherein the sensor includes first and second dies. Embodiment 31: A method of proving a magnetic sensor, comprising: providing a signal generator module including a magnetic position sensing element; coupling an analog signal processing module to the signal generator module to generate a linear output signal corresponding to information from the position sensing element. Embodiment 32: The method according to embodiment 31, further including coupling a signal inversion module to the signal generator module, the signal inversion module for inverting a first waveform to provide a first inverted waveform and for inverting a second waveform to provide a second inverted waveform. Embodiment 33: The method according to embodiment 32, further including providing the signal generator module, the signal inversion module, and the signal processing module on a single substrate. Embodiment 34: The method according to embodiment 31, further including providing a magnet for the magnetic position sensing element having a plurality of pole-pairs to reduce a maximum angular error. Embodiment 35: The method according to embodiment 31, wherein the magnet is a ring magnet. Embodiment 36: The method according to embodiment 31, wherein the magnetic sensor is a Hall effect sensor. Embodiment 37: The method according to embodiment 31, wherein the magnetic sensor is an AMR sensor. Embodiment 38: The method according to embodiment 31, wherein the magnetic sensor is a GMR sensor. Embodiment 39: The method according to embodiment 31, further including a first die for circuitry and a second die for a Hall effect sensor. Embodiment 40: The method according to embodiment 39, wherein the second die is formed from GaAs. where θ indicates an angle of the magnet in relation to the first and second magnetic sensors, offset is a vertical offset of the first and second waveforms with respect to ground, A is an amplitude of the first and second waveforms, and k is a real number affecting gain and vertical offset of the output. The sensor of claim 1 or claim 2, wherein the second region corresponds to a position range in which output would be non-linear without inversion of the first and second waveforms. The sensor according to claim 3, further including a region indicator bit to indicate position range in the first or second region. The sensor according to claim 1 or claim 2, wherein the first region spans about one hundred and eighty degrees. where -sin(θ) refers to the inversion of the sine wave about an offset voltage and sin(θ) and cos(θ) embody the amplitudes and offsets associated with the sinusoids. The sensor according to claim 6, wherein the first region corresponds to a range for θ of about 315 degrees to about 135 degrees. where A is an amplitude of the first and second waveforms and b is a constant. The sensor according to claim 1 or claim 2, wherein the signal processing module includes an analog multiplier. The sensor according to claim 1 or claim 2, wherein the sensor is provided on a single substrate. The sensor according to claim 1 or claim 2, wherein the magnetic sensor includes a magnet having a plurality of pole-pairs to increase a frequency of generated waveforms for reducing a maximum angular error. The sensor according to claim 11, wherein the magnet is a ring magnet. The sensor according to claim 1 or claim 2, wherein the magnetic sensor is one of a Hall effect sensor, an AMR sensor and a GMR sensor.